We just got this report in from Florida. Hey, I would just like to say that I got my Target Snapper Hooks the other day and they worked great! I went out on my boat today and I caught some gap groupers in the 20"-36" range. I lost none of the hooks, and none of the fish were gut hooked! I would definitely recommend these hooks to anyone! Colin and Phil sent in a report last week about three excellent days fishing with 10-15 knot direct offshore winds at Ninety Mile Beach. We have found the three great photos we should have put with their report. All the fish were caught between Waipapakauri ramp and Hukatere. Below Left : March 24th we had 2 sets, catching 11 kahawai and 5 snapper. Below Right : March 26th we ran 2 sets and caught 9 kahawai and 12 snapper. It was a beautiful fine day with 10 knots southwesters predicted on the weather forecast. I arrived mid morning to watch a couple of the locals getting their lines out about 200 meters and then gliding gracefully into the sea. There was no wind! I mucked around till about 3.00pm and returned to be greeted by a couple of the locals trying again. This time just enough wind to get my 8ft delta up and out with just 10 hooks. It took ages to go out due to very light winds but eventually settled about 600 meters straight out. I retrieved the gear after about an hour with three small snapper of which two were keepers. I ran a mix of floating traces and ordinary traces, all fish were caught on the ordinary traces. It was a great day none-the-less and a good feed of fresh fish for breakfast the next day...YUMMY. Enjoy all, looking forward to more this week. Last week Robbie reported on his massive 3kg kahawai and this week sent the photo through which, according to Robbie, doesn't do the fish justice. 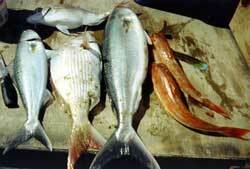 To give you a better idea of size, the snapper to the left of the kahawai is a healthy 1 .5kg. 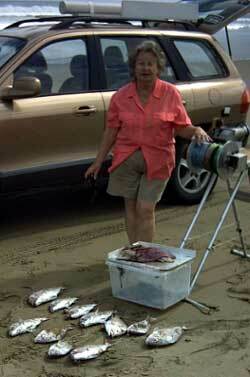 Robbie's photo displays a typical west coast mixed bag. We arrived at the beach just in time to see another kite fisher bringing in his gear. While he had only caught one small snapper, that was good enough for me! I quickly put up my pocket sled rig and sent it out 200 metres in the very light wind but it returned empty. On the second set in a strengthing wind I achieved a set of 500 metres but still caught nothing after an hour. 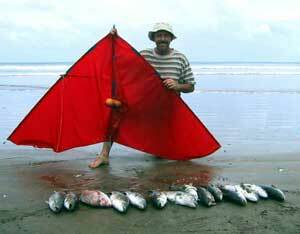 However, during the time the kite rig was out fishing we caught 2 snapper and 1 kahawai surfcasting while using Paul's floating beads. Are the floating beads available in luminous yellow\green? 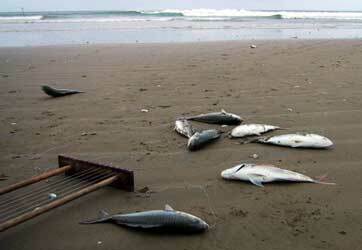 Here is the photo we promised you last week of our catch taken at Muriwai. We caught 17 fish and put 3 back. The kawhai and sharks are filleted on the board . Jeff Muller stopped in to the shop last week and reported that he was fishing a 65kg bottom longline rig at Campbells Bay in Auckland on April 2. 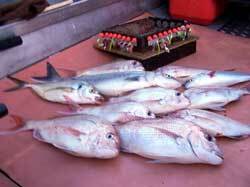 Jeff set 15 hooks for 2 snapper at 2.5kg each and both of them were taken from the first two hooks nearest the bottle. 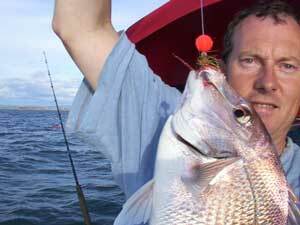 Jeff also reported that he was fishing at Mairangi Bay the day before and caught one good sized snapper. Ed. Note: Both Campbells Bay and Mairangi Bay are rocky and reefy areas. It is not advisable to fish these areas with a longline rig. Dropper rigs are much safer from these beaches, particularly when using a ledger rig. Check out the following link for ideas on how to more safely fish over intermittent reef. Another report passed on by Rob was from kitefisher Andrew Batty. Andrew reported on his latest trip out to Muriwai Beach on April 5. Fishing a dropper rig in fickle winds, Andrew ran two 5 hook sets baited up with salted mullet for a great result of 8 snapper which Andrew said averaged 34mm in length. I had an awesome trip across from Weymouth to one of the local gut-ways at 3.30 pm yesterday. The first 20 minute set of 25 hooks in four to five metres of water came up with three snapper and a middle sized kahawai. The second set was even better with six more snapper (only one needed to be measured), a nice trevally and a giant kahawai. Needless to say there was nothing on the rods. I was home again after only three hours with a nice bag of fish. I'm using floats all the time now as they keep the baits away from starfish. They also seem to keep the trace clear of the backbone which helps prevent twisting when setting in the Manukau tidal stream. I have just replied to Forest and Bird giving my thoughts on the proposed West Coast Marine Park- thankyou for the warning in your news. This proposal is ideological drivel promoted by an organisation who care nothing for recreational values of the majority and who see no value in any place other than that where they have imposed their will. Again they are promoting a nonsensical approach to protection of species by proposing to totally devote that area, which in this case is large, to the protection of those species, when there is no evidence, either within the discussion document or elsewhere, that the protection afforded will make any difference at all. Worst of all their proposal is in deference to the needs of the current users. Herein again we see the needs of Maori promoted above all other human considerations with the by-line that they (Maori) have cultural and spiritual values that they wish to attach to the land. I, and I am sure many other fishers, walkers, campers and other users of all nationality, religion and creed also have significant spiritual value embedded in our ability to access the beach and my culture demands that areas such as this should remain the preserve of the wider community as they are an indicator of, and a contributor to the health of the community, particularly families. It should be impossible for F&B to justify promoting the closure of this whole stretch of Coast to their end. I do not doubt that there are some areas that should be more vigorously protected from damage where it can be shown to be occurring. For my part it is impossible to see the harm to any species from a four wheel drive vehicle gaining access to a remote public beach to provide individuals or families with a days fresh air, exercise and entertainment. The discussion document seeks to protect the environment from overfishing, citing increasing use as Auckland grows, among other considerations. Practically they intend to achieve this by completely closing the beach to fishing, or by preventing access, or by making access so difficult it is not achievable, or by closing the beach to fishing in favour of permitted fishing, where the permits are issued by and generally for, one section of the community. In my view overfishing is an emotive terminology added to this document for impact. Any reasonable person can see that the fish here have no reasonable chance of finding a hook, even if they spent a lifetime looking, such is the scale of the place versus the effort waged by recreational fishers. Even the commercial effort does not seem to be that great if judged by observation and recreational results. Your readers need to be alarmed at this proposal. They need to get over their Kiwi apathy and complacency and get off their bums and make their views heard or this lot of tree huggers will cause their will to be imposed on us. Please place the Forest and Bird questionnaire document on your website so readers can easily access it. Place an alternative COMPLETED one there also for busy fisherman's convenience. 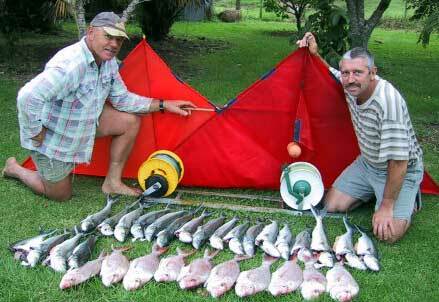 All fishers should remember that it is only the squeaky reel that ever gets oiled. We should, as responsible people also actively discourage the miss-use of the area by the minority who refuse to acknowledge that their actions in ignoring signage and driving their vehicles in sensitive areas, dumping rubbish, and leaving unwanted fish and waste on the beach impacts only on legitimate users. We should try having a quiet word. Failing that report them or simply just take their rubbish home with yours. Finally I noted that this proposal is undertaken through funding provided by the Lotteries Grants Board. Is it not ironic that revenue provided by the majority is made available to the minority who then use it to try to impose their will on the majority! I for one will still buy my lotto ticket - I am trying to win so I can buy my own fishing spot before Forest and Bird and every other bunch of do-gooders own them all. ED: I will provide an opportunity for subscribers to respond to the West Coast Marine Park proposal next week. 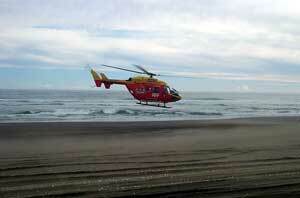 RECENT ACCIDENT AT MURIWAI BEACH! 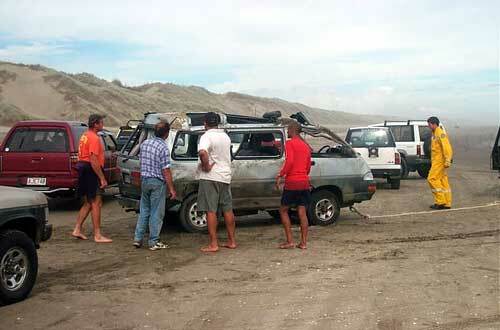 Be careful on the beach or your vehicle might wind up like this one did recently at Muriwai Beach. Keeping an eye out for soft sand, partially buried vehicles, logs and kite and kontiki fishers and their gear is easy if you are not going too fast. I hear that hoons doing dougnuts on the beach are the main reason for vehicles rolling. I have witnessed two vehicles flip because driving in ever decreasing circles on separate occasions. One of these was seriously injured, also requiring the rescue helecopter and the other one cost us a days fishing as we towed the very shaken driver back from the top end of the beach. Bad driving on the beach is often cited when beach closures are proposed, lets not give them that opportunity, drive carefully.